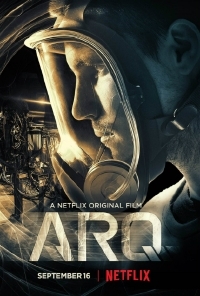 Netflix has released a trailer for their upcoming sci-fi flick ARQ. Written and directed by Orphan Black's Tony Elliott, the film will have a world premiere at the Toronto festival on Friday, September 9 before hitting the streaming service on Friday, September 16. Robbie Amell stars in the time-twisting mystery along with Rachael Taylor (666 Park Avenue, Jessica Jones). In a future where corporations battle against sovereign nations over the last of the world's energy supplies, young engineer Renton and Hannah find themselves attempting to save an experimental energy technology that could end the wars. The catch is, the technology has created a time loop that causes them to relive a deadly home invasion over and over again. They must figure out how to stop the time loop and come out of it alive. ARQ was produced by XYZ films. Just saw this last night and really enjoyed it! Just goes to show you can produce a thrilling mind-bender of a film that takes place in a minimal setting with a good writer/director behind the wheel!